Monday marks the end of October and the end of the Stampin' Up promotions for this month. There are 2 this month. The 2nd promotion applies to the Simply Sent Card Kits. 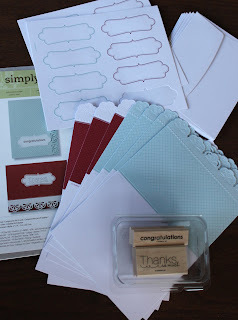 These are a great way to make fast and simple homemade cards. They also make great gifts for friends who don't do crafts. This month when you buy 2 sets (prices range from $11.95 to $13.95,) you'll be able to select a coordinating stamp set for free. There are 3 sets from which to choose.